Walmart made another announcement about its path to 100% renewable energy. By the end of 2020, it will increase renewable energy projects six-fold, roughly the power produced by two US fossil fuel plants. And to cut energy intensity perÂ kWh 20%Â from 2010 levels byÂ usingÂ LEDs, building energy management systems and installing efficient HVAC andÂ refrigeration systems. "More than ever, we know that our goal to be supplied 100 percent by renewable energy is the right goal and that marrying up renewables with energy efficiency is especially powerful," says Mike Duke, CEO. When fully implemented, Walmart expects to save more thanÂ $1 billion a year on energy costs and reduceÂ greenhouse gases theÂ equivalent of taking 1.5 million cars off the road. Walmart says the move will effectivelyÂ haltÂ the growth of greenhouse gasÂ emissions from its largest source - energy to power its buildings, evenÂ significant anticipated growth in stores and sales. 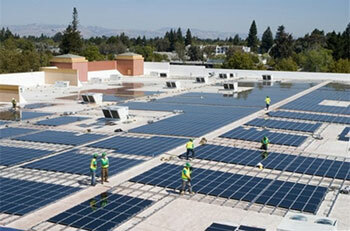 In 2012 alone, Walmart added nearly 100 renewable energy projects, bringing the totalÂ nearly 300 (mostly solar). The company leads the US for usingÂ on-site solar with 200 projects thus far and plans to install solar on 1000 more rooftops by 2020. Besides producing its own energy, it will buy it from utility-scale projects such as wind, small hydro and geothermal. Since Walmart first targeted 100% renewables in 2005, it hasÂ installed or purchasedÂ enoughÂ renewable energy to supply 21% ofÂ its buildings' total electricity and 17% of buildings' total energy use, enough for a US city of 250,000 people. If you look specifically at how much on-site solar and the little bit of wind are producing, it's about 4% of Walmart's mammoth energy footprint. Last year, Walmart completed its biggest solar system to date - 3.3 MW on a distribution center near Phoenix, Arizona,Â producing 30% of its electricity.